Recently I read an interesting article that looks at the facts and numbers of Facebook’s business model. According to this article it’s just matter of time before the Facebook ad bubble will burst and take hundreds of other sites relying on the same principle down with it. But what I find even more surprising is that although Facebook can boast with more users than any social networking site in history, it feels like a graveyard. To give you an example, I administrate various fb pages for businesses, with “like” counts of up to 22,000. The inflationary nature of Facebook turns that into a few dozen active users. This activity can be pushed by posting ‘engaging’ statuses and photos, etc. 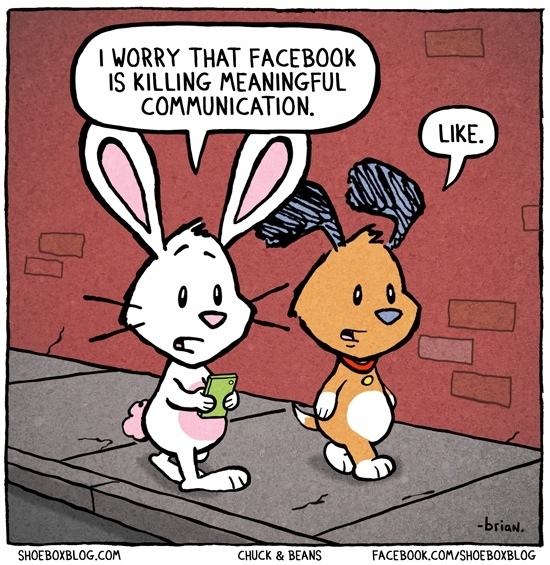 of course, but I still can’t shake the feeling that Facebook is a social desert. Maybe there’s a correlation of large user bases and low activity, maybe people are just tired of liking and sharing. Whereas Twitter is very limited in what it does, Facebook tries to do and be everything from photo sharing (and making) app, to event management, contact database, gaming platform and emailing service. I don’t have anything against the principle of sharing a few photos with family and friends, but the Facebook platform seems to have spiraled out of proportion like a rapidly spreading tumor. Facebook has the scale, the platform, and the brand to be the new Google. It only lacks the big idea. Right now, it doesn’t actually know how to embed its usefulness into world commerce (or even, really, what its usefulness is). read April 13, 2014 2 Comments A.K.